the basic element of the cover structure are the roof girders. 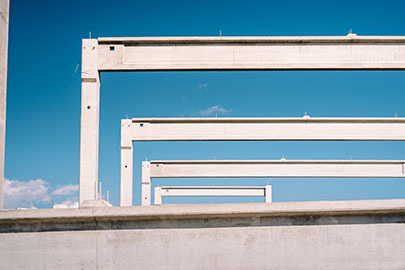 Prestressed girders (pre-tensioned concrete) can be manufactured up to a span of over 36 m, but are most popular in spans of 18 m to 25 m. The girders rest on columns and form a system bracing them horizontally and supporting the roof structure, including purlins in purlin roofs. The most commonly used is the I-section. In the longitudinal direction, the shape of the girder can be without pitch, mono-pitch or double-pitch. 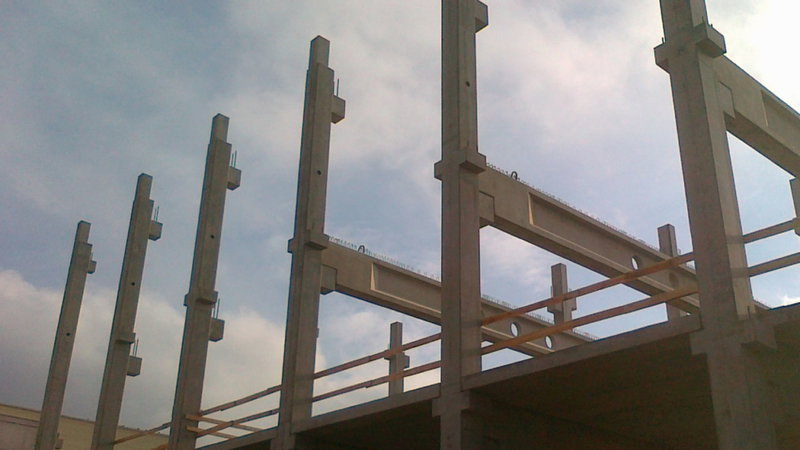 precast elements used as vertical, load-bearing elements of framework and mixed structures. They are divided into two types: main (static system element with a girder) and façade (loaded with external walls and acting on the wind). 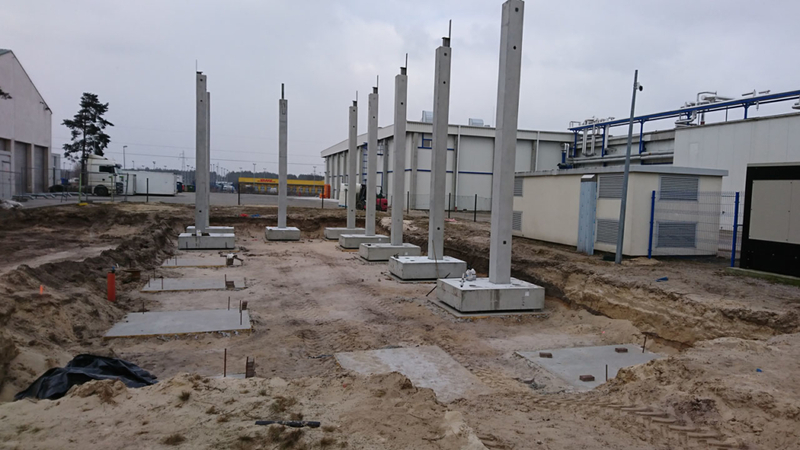 precast footings are an alternative to monolithic foundations in the construction of buildings due to the speed of installation. These elements can be used as a supplement to the basic solution in the form of columns integrated with footings. They are used for the foundation of additional elements, e.g. columns. 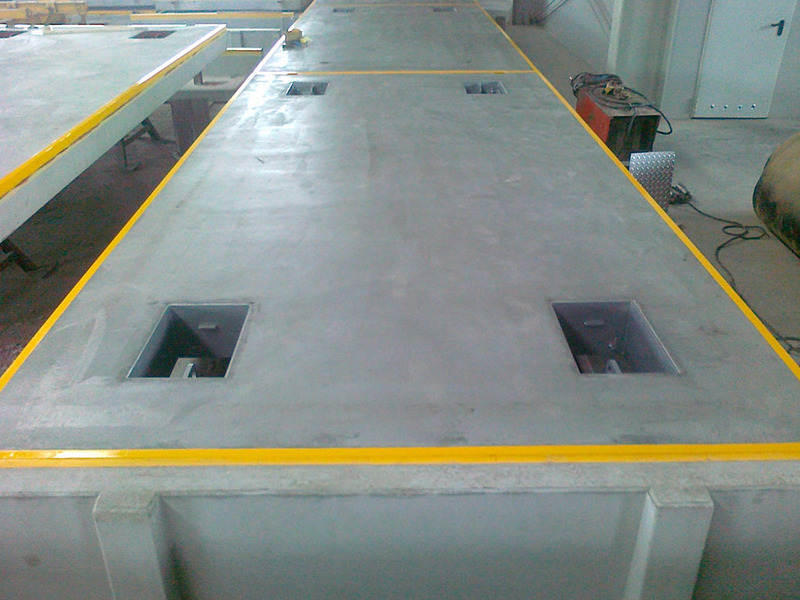 Finishing of the footing surface – when necessary (significant horizontal forces) the bottom of the footing can be roughened or dowelled to increase force transmission efficiency. Surface prepared for possible coating protection; chamfered edges; anchor plates and fittings according to customer requirements. 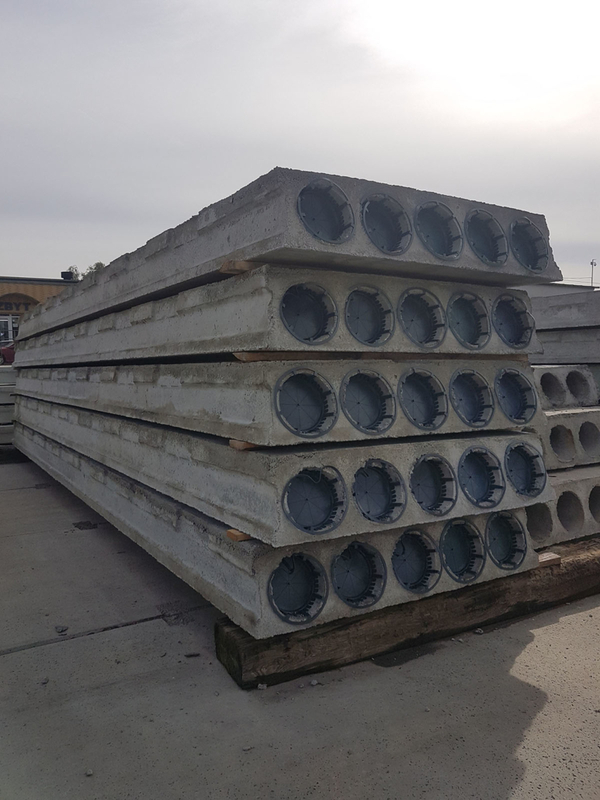 We divide the footings into three solutions for the foundation of reinforced concrete columns: with starters connection, with system joints and bell joints. i.e. 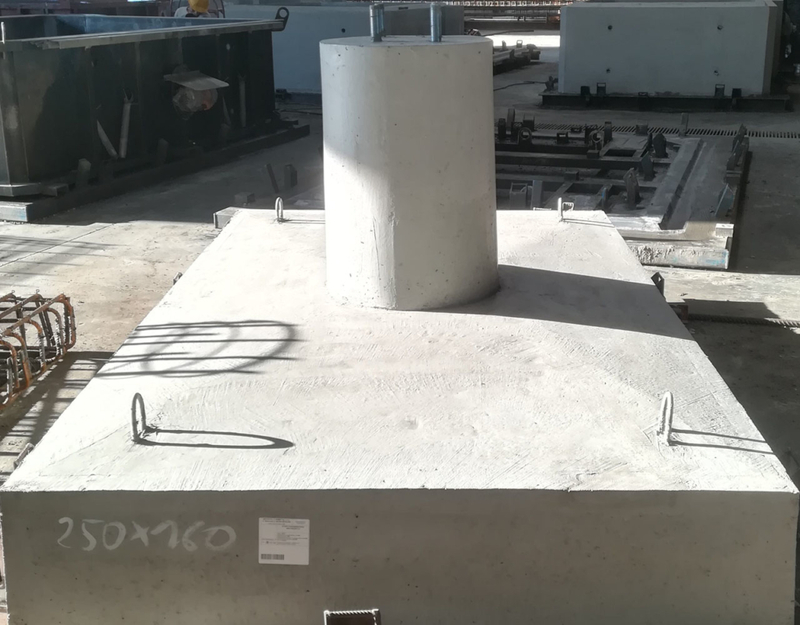 column and slab footing precast as one element. 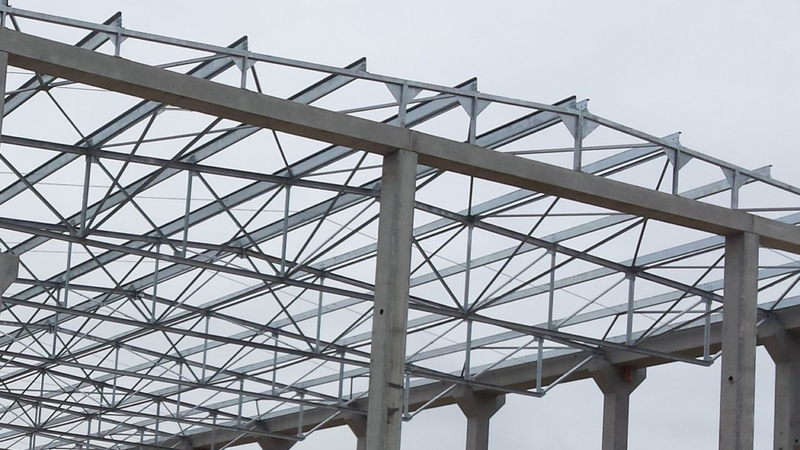 these are roof girders – usually prestressed – based on trusses, providing direct support for roofing. The cross-sections of these elements can be rectangular, trapezoidal, T– or I-shaped. 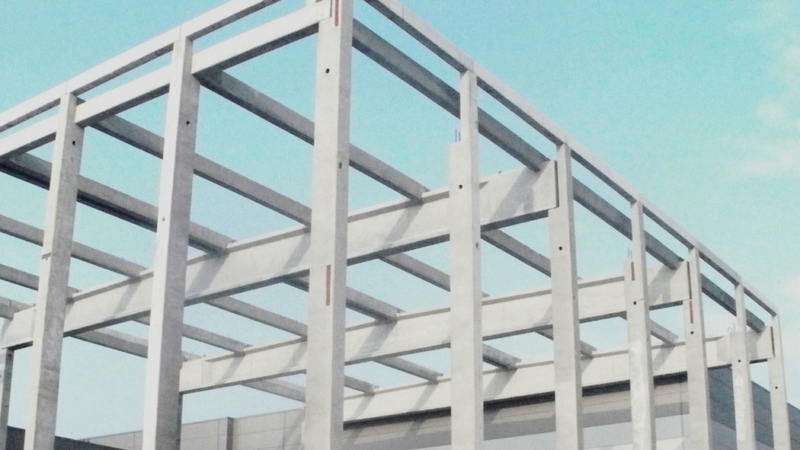 used for double spacing between inner and outer columns, the most common spacing of which is 6 to 8 m, dictated by the optimal span of curtain walls. Every second girder is supported by trimmers. beams are manufactured to individual customer’s project. Due to their cross-section, we divide the beams into: square, rectangular, type B, type L or inverted letter T. Formerly, the Polish term “rygiel” (spandrel beam) was used, hence the frequent designation of the rectangular type with the letter R. This results in RT or RL. Traditional reinforcement is used for lightly loaded beams. 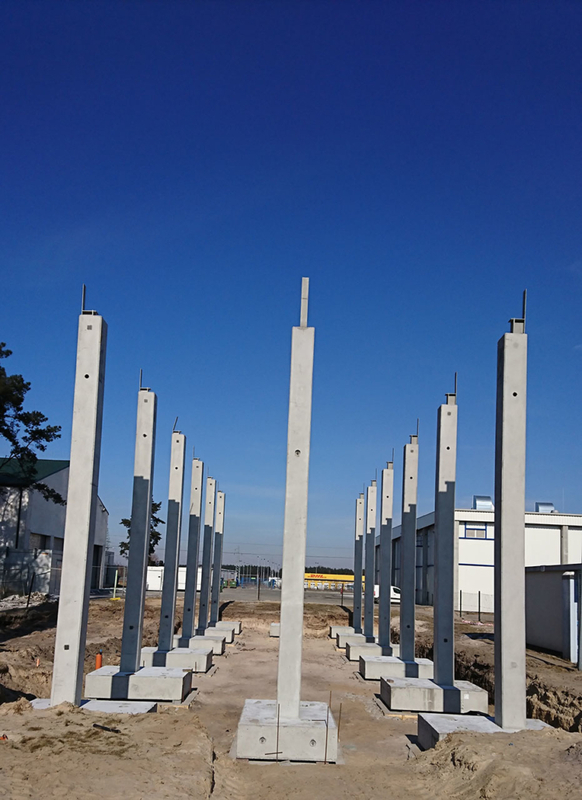 They can be used as straight, with brackets or protruding reinforcement for monolithic connections on site. 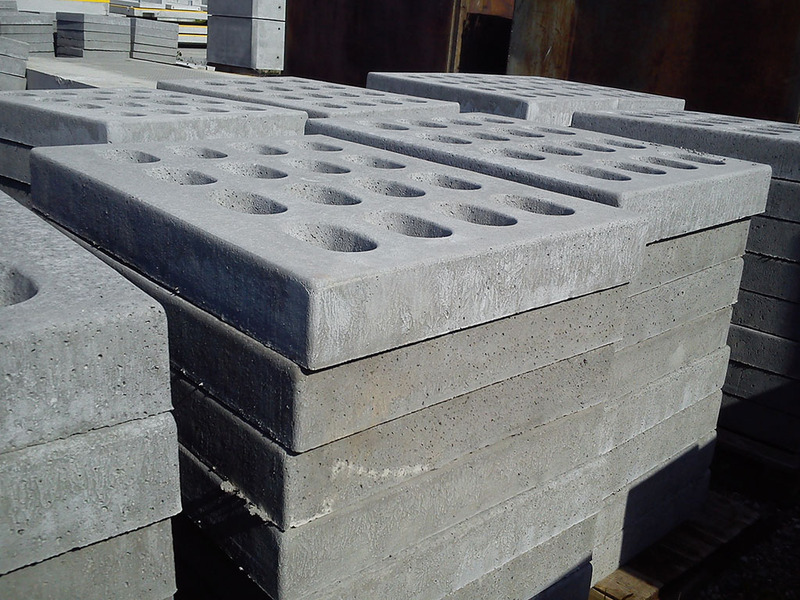 frequent products of precasting are ground sills, designed as an outer wall based on foundation footings of the framework columns. 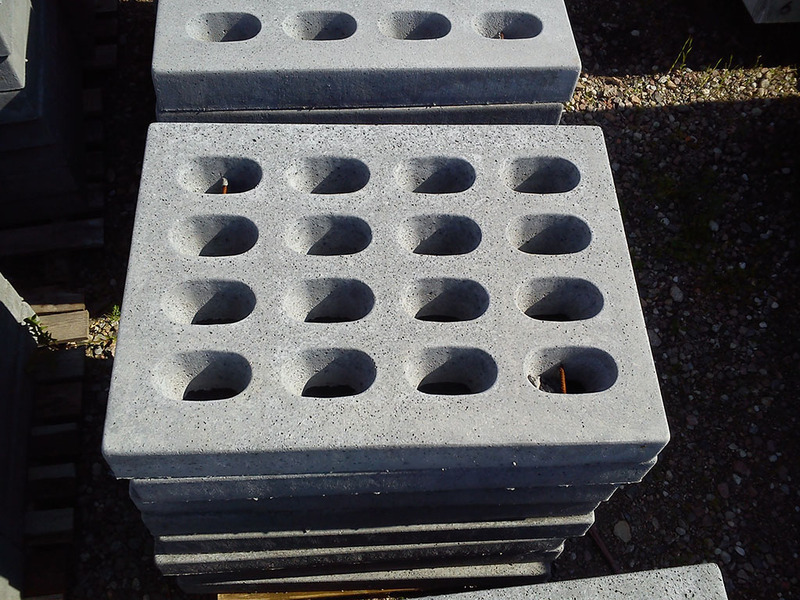 Ground sills are produced as solid, two- and three-layer reinforced concrete elements with thermal protection. They are manufactured on the basis of individual designs in sizes and shapes tailored to the needs of individual customer projects. 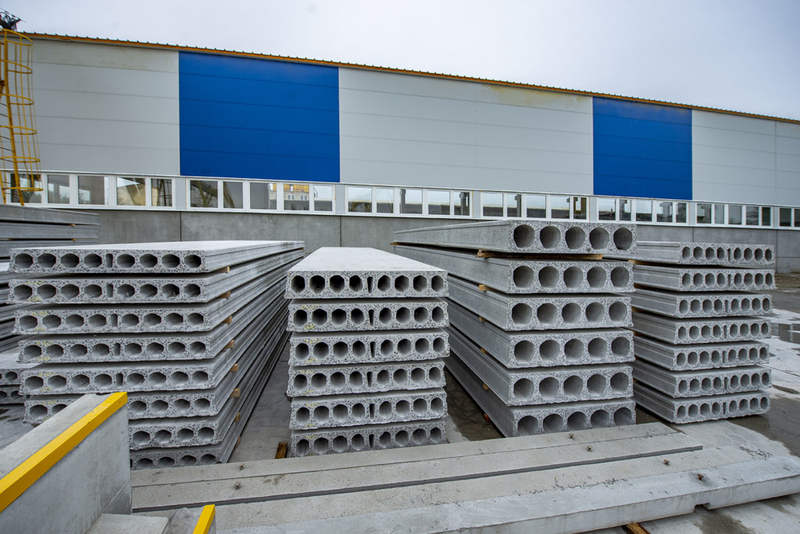 Precast products can be factory equipped with anchor plates – steel fittings, system elements. 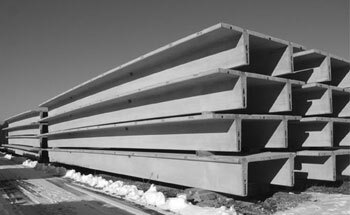 Precast sill beams are commonly used because of their resistance to impact and environmental conditions. manufactured by industrial methods on long tracks, where the required lengths of elements are obtained by cutting a band formed by specialised machines with the length of the track and the required width of 1.2 or 0.6 m. Matching the floor width is obtained through longitudinal cutting in the axis of the channel (hollow core). Characteristic feature are longitudinal channels (hollow cores), which ensure optimal load-bearing capacity of the cross section at low weight of the element. 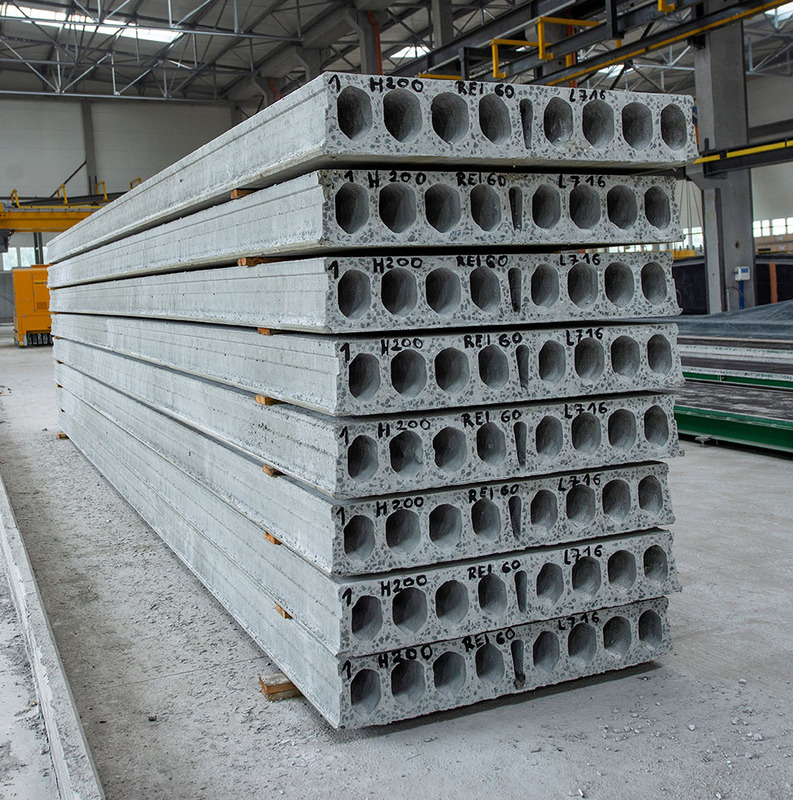 Prestressed hollow-core slabs range in height from 150 to 500 mm, with different degrees of prestressing reinforcement to suit different load sizes. 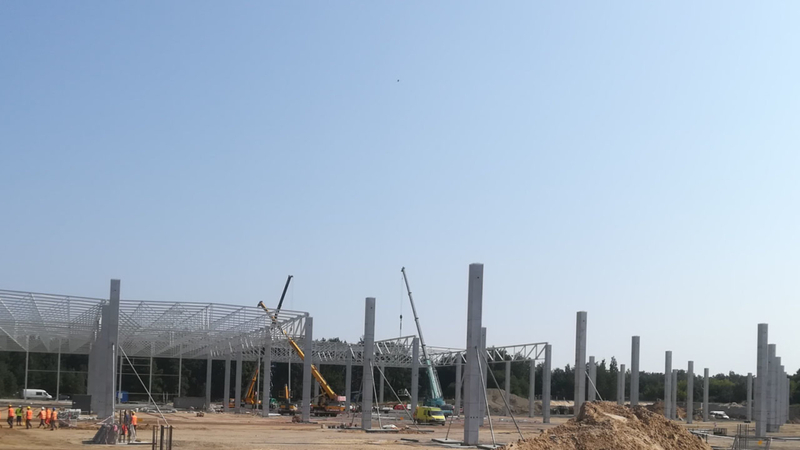 The span of the hollowcore slab, which can be obtained for the load-bearing structure of the floor and roof in the production of up to 20 m. Production in steel forms ensures that the lower surface of the ceiling slab is smooth and of high quality. Upper surface rubbed off or roughened when concrete overlay is planned. In order to obtain a stiff floor structure, pouring concrete joints and tie beams on site is sufficient. No formwork or installation supports are required. 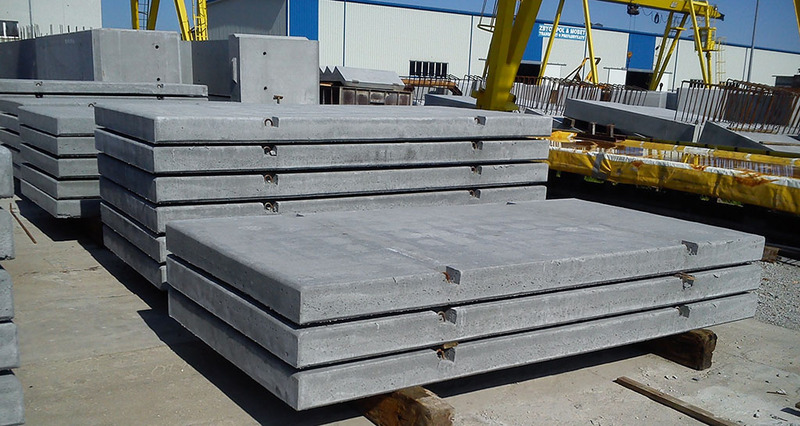 Precast docks can be individually adapted in the production process to all types of dock ramps and their foundation conditions. It is also possible to redesign docks originally designed as monolithic with a precast option. Standard dimensions 340×270 cm with a wall thickness of 20 cm. 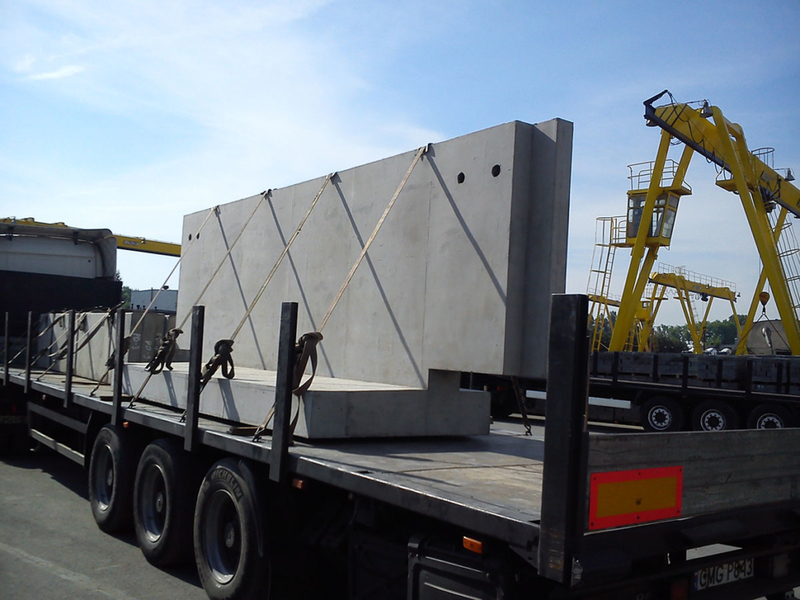 Precast elements of lorry weighbridges are used for weighing vehicles with load capacity up to 90 tons. 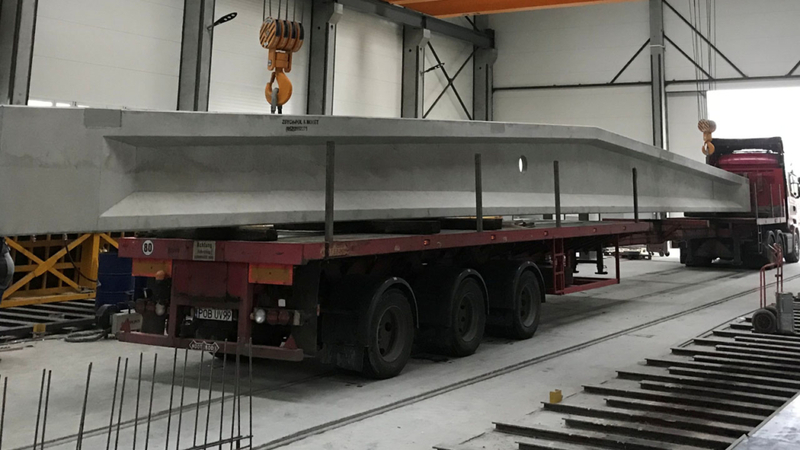 Due to the large variety of the elements of precast weighbridges, it is possible to configure various weighing modules up to a length of 22 m.
cover slabs with modules 600×300 and 800×300 cm for any configuration according to the customer’s needs. Manufactured entirely in industrial conditions from C40/50 class concrete reinforced with steel, additionally protected against harmful chemical substances. 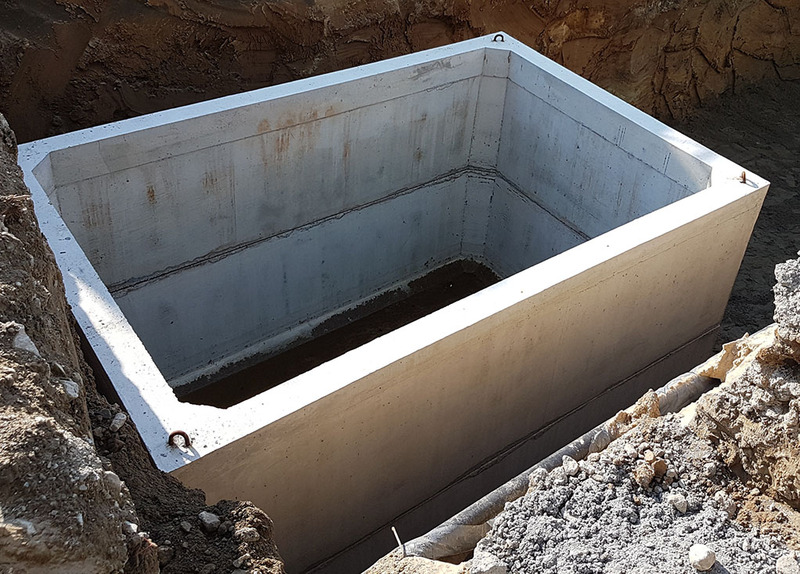 Reinforced concrete tanks are sealed and septic. There is also a possibility of making drainage holes. The tanks can be put together in batteries, thus creating condensed tanks of unlimited capacity. the permissible operational load for the tank roof is 12.00 kN/m2 with the possibility of increasing the strength on request. 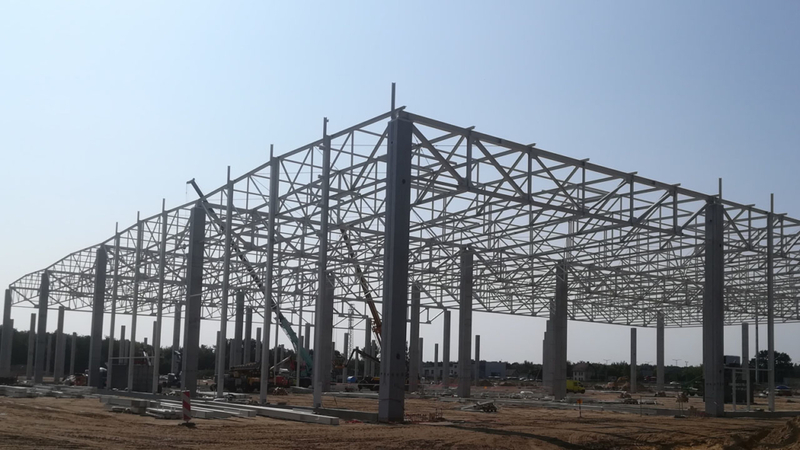 For floor spans over 20 m, double-T floor slabs with 900 mm ribs are used. 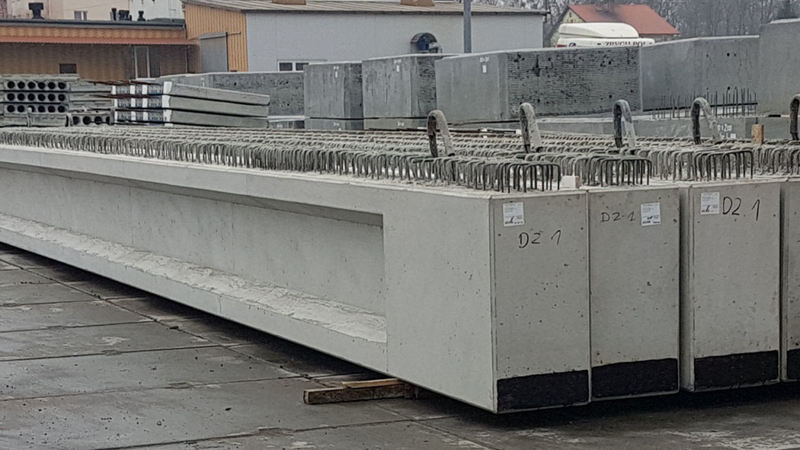 The slab-ribbed floor with 1.2 m rib spacing with an upper slab thickness of 5 to 12 cm and a width of up to 2.9 m. The slab can be made without prestressing to a length of 12 m. However, they are used for longer spans with a high load of over 25 kN/m2. Double-T slabs provide freedom in locating the openings in areas outside the ribs. The bottom of the slab is smooth from mould, sides from mould; the upper surface is rubbed off or roughened for bonding to concrete overlay. 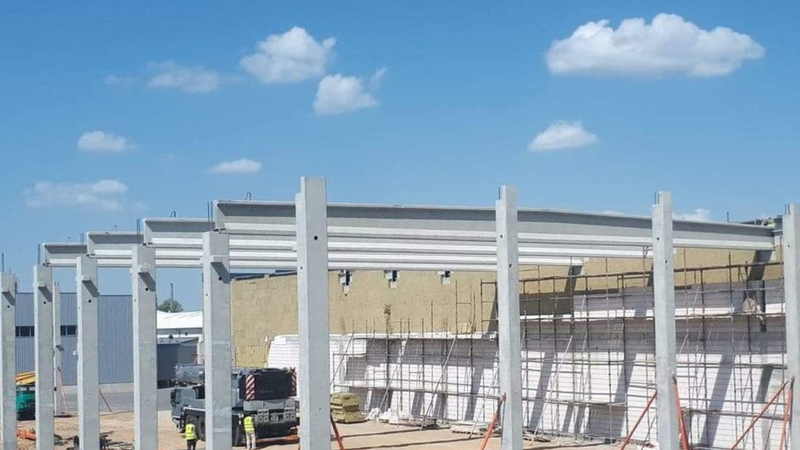 Double-T slabs are particularly advantageous in industrial construction as well as multi-storey car parks, where ribbed floor is not an architectural obstacle. 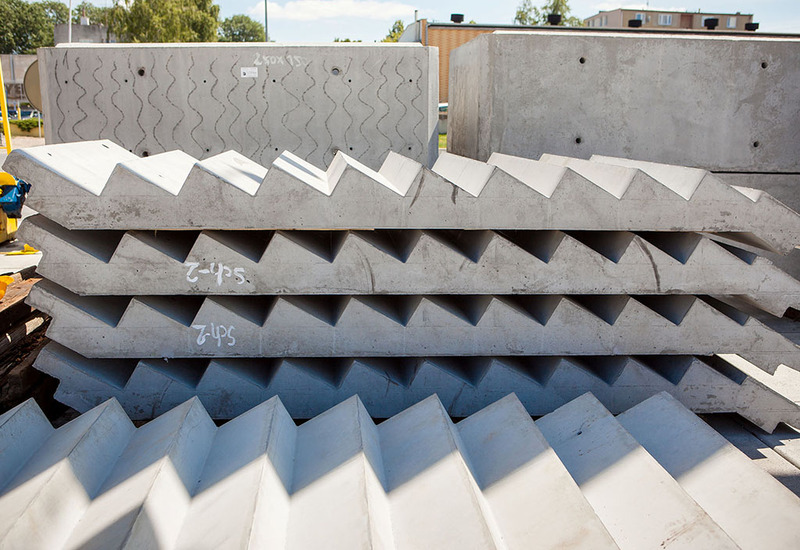 Precast road slabs are an asphalt alternative: cheaper and quicker to lay. Their advantage is high resistance to various types of external factors, loads, destruction, and the ability to quickly dismantle and move to another place depending on the needs of the construction site. 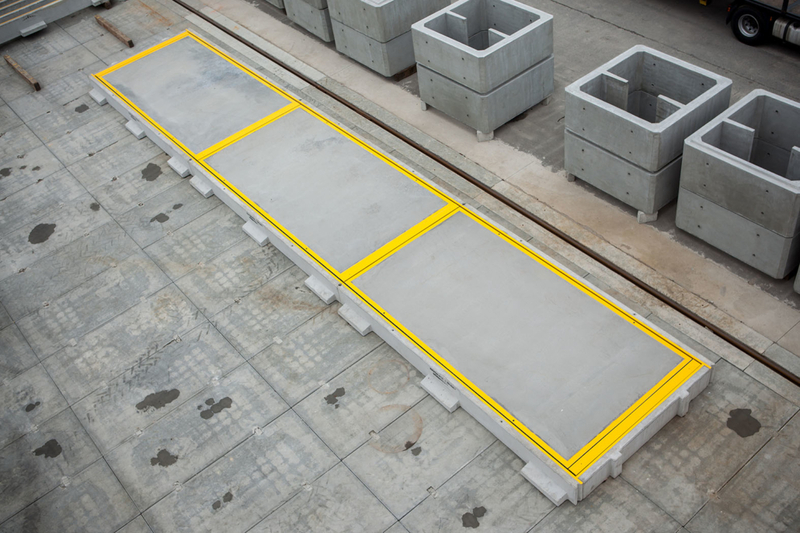 Depending on the reinforcement, they can withstand high traffic density and heavy vehicles. 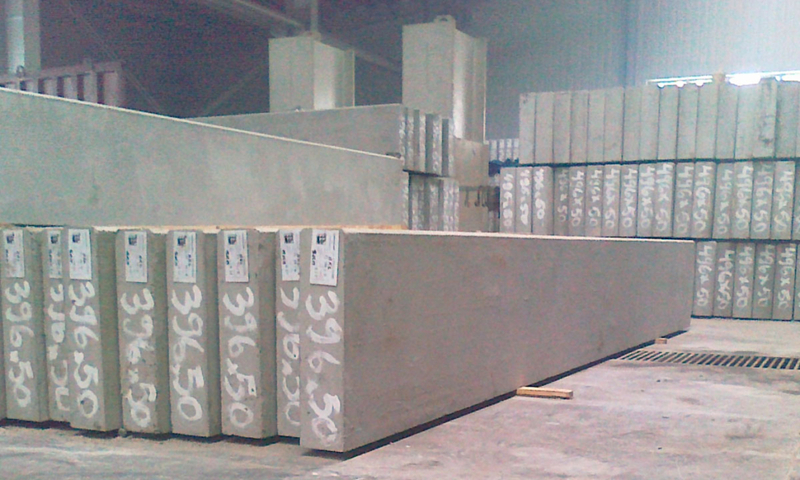 A Jomb type precast slab is a heavy-duty slab. Jomb slabs are an ideal material used to reinforce embankments, slopes and water drains. 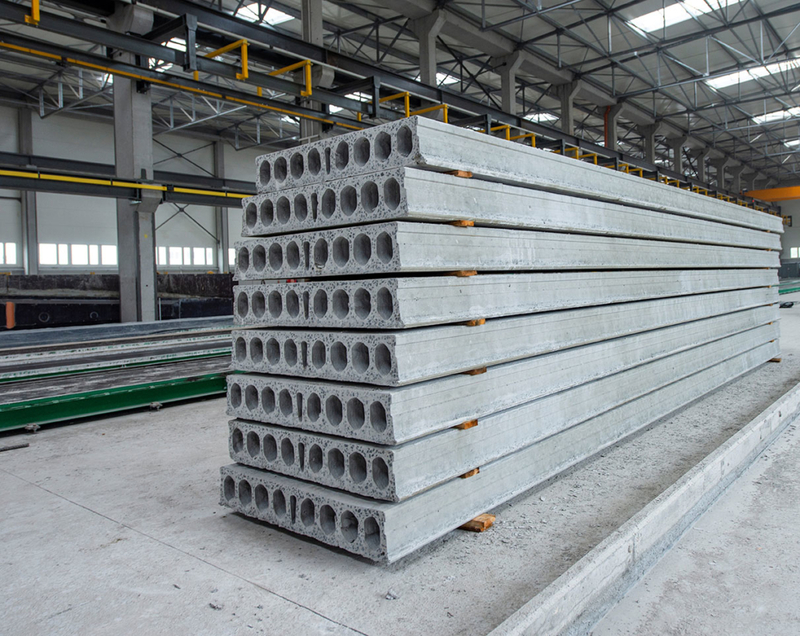 Hollow-core floor slabs are reinforced concrete floor elements used in general, residential, industrial and public construction. Hollow-core slabs are coverings for floors between storeys and slab roofs. 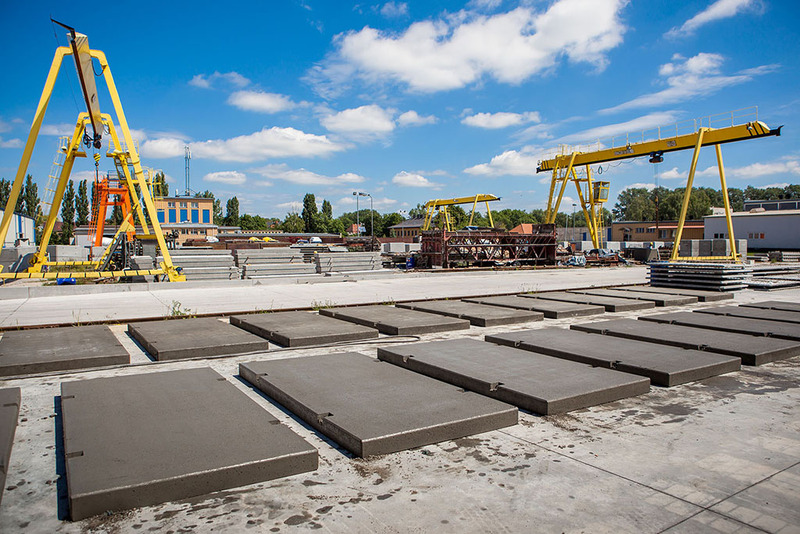 Hollow-core floor slabs are characterised by relatively low weight and strength up to 1000 kg per 1 m2 of external load due to the channels running through their entire length. We make slabs of lengths adjusted to individual design needs of the customer. 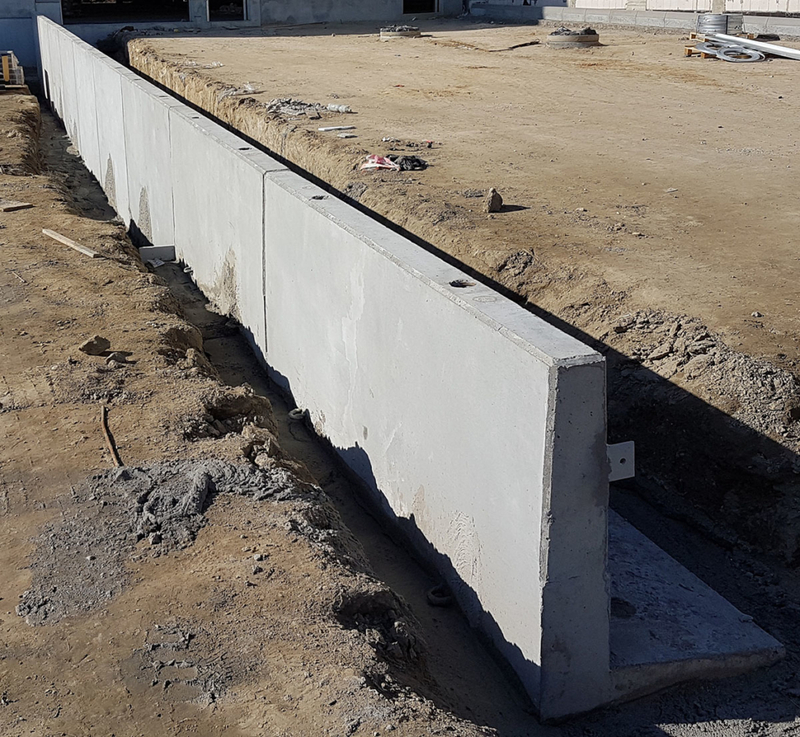 Retaining walls are vertical structural elements used to transfer the pressure of the protected structure to the ground. Retaining walls help to reduce work costs and save time. 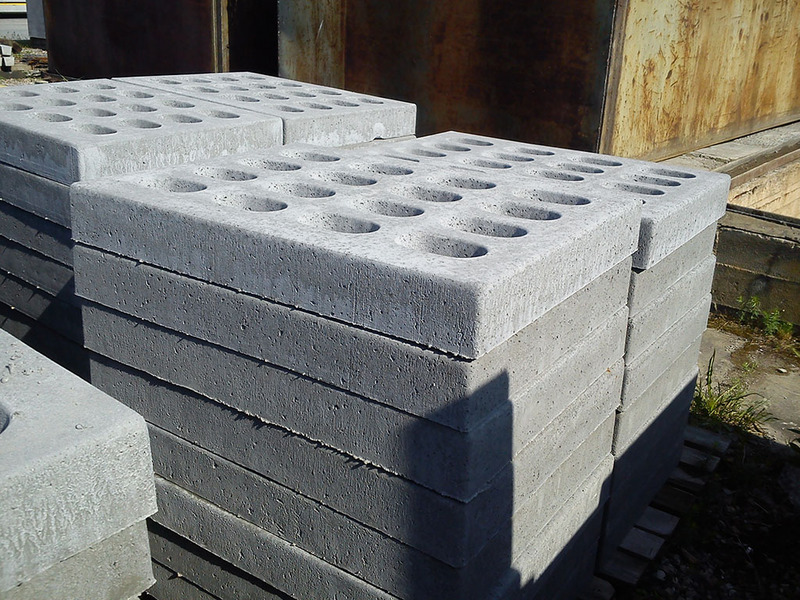 They are commonly used in road construction, and more and more often as elements of small architecture. Manufactured precast elements of staircases are individual structural elements adjusted to the needs of architectural and construction designs.